The problem isn’t limited to large systems, either: More than 70 percent of freshmen at Delaware schools needed remediation courses in either math or English (or both). 2 Such classes usually are taken at the student’s expense but do not count for any credit beyond satisfying requirements for other courses. In other words, non-proficient students are paying extra simply to get up to speed. Many students and parents believe math skills can be achieved in a short time, and that once learned, those skills will carry into college. Middle-schoolers who struggle with math have years to turn it around, right? Unfortunately, for many students, this just isn’t the case. They may eventually, and temporarily, learn the concepts to manage above-average grades and score well on the ACT or SAT, but they find themselves woefully unprepared when they step on a college campus. Obviously, the stakes are high for American students to succeed in math. Seventh and eighth grade are important years in the overall math curriculum. The concepts learned in middle school will provide an essential foundation for geometry, trigonometry, and pre-calculus in high school. Furthermore, many college algebra courses will fall back on the algebra taught in junior high. Excelling at math in middle school can lead to years of success, both academically and in the real world. This guide will explain how Common Core aims to improve math education in this country and how these new guidelines will affect seventh-graders. It will describe the Common Core-driven concepts students will learn during this critical academic year. And it will provide tips for students and parents to not only survive middle-school math, but also to excel. 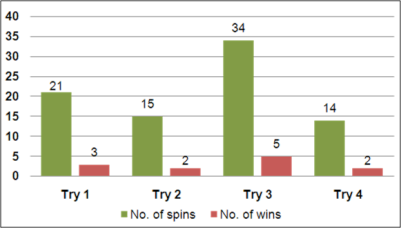 1 Fall 2013 Regularly Admitted First-Time Freshmen Remediation Systemwide, California State University. 2 “Most Delaware Grads Not Ready for College Math”; The Wilmington News Journal; September 24, 2014. The state of the American educational system has been in a precarious position for many years, especially in math. The test scores of U.S. students lag behind many other nations; an atmosphere of distrust and confusion has developed among politicians, teachers, and parents; and students aren’t learning the skills they should be learning (as evidenced by the remedial courses many college freshmen find themselves taking). To address these concerns, policy-makers, civic and business leaders, educators, and parents came together to develop the Common Core State Standards, or CCSS. Common Core has been adopted and implemented by 43 states and the District of Columbia, and it seeks to revolutionize how children are taught math and English. The goal of CCSS is to establish consistent, nationwide guidelines of what students should be learning each year of grade school, middle school, and high school. Common Core provides the grade-by-grade standards, but states, school districts, and individual are tasked with developing and implementing CCSSdriven curricula within classrooms. And because the guidelines are consistent among participating states, much of the guesswork in analyzing and comparing data is eliminated—what a seventhgrader learns in one state should be the same as another seventh-grader in a different state. Any educational innovation today would seem to introduce more concepts for students to learn. However, Common Core takes an opposite approach, focusing on fewer topics, but ones that are more thoroughly taught. CCSS turns the “mile-wide, inch-deep approach” on its ear by emphasizing the total proficiency of a concept over the mere exposure to it. This initiative is a key tenet of “Singapore Math,” which is a clear influence on Common Core and favors mastery over memorization. CCSS aims to provide a solid foundation (a “deep command,” so to speak) of math concepts that will foster even stronger learning in the long run. Indeed, another of Common Core’s goals is to string math instruction to itself over the educational lifetime of the child. A learned concept isn’t a one-and-done deal, but instead, ties into what a student may learn next year, which will tie into what he or she will learn the next year, and so on. The conundrum of college freshmen in remedial courses has its roots in the opposite approach—students are taught algebra concepts in middle school and may never see them again until they are 18 and have lost the skill set. Under Common Core, those concepts are reinforced all the way through high school while being applied to other concepts. The criticism of Common Core has increased over the past year as the standards were fully implemented in the remaining participating states. Concerns have been voiced by educators, parents, and politicians, but much of this debate has confused Common Core and the way it is being developed and implemented. For example, parents frustrated with standardized testing may blame Common Core, but Common Core sets no testing guidelines—states and school districts do. The trepidation over CCSS overlooks the fact that it ultimately strengthens math instruction. Middle-schoolers will emerge from a Common Core-driven curriculum with a deeper knowledge of math, skills to tackle any school or realworld math challenge they encounter, and a foundation for the math they will encounter and can build upon for the rest of their lives. A strength of Common Core math is that it provides students and parents a defined set of concepts children will be taught, and be expected to know before advancing to the next grade, for each year of their education. For example, CCSS includes a fluency requirement—concepts students must master (and not merely be proficient in) by the end of the school year. For seventh grade, the fluency requirements are ratios and proportional relationships and arithmetic of rational numbers (both will be explained here soon). This Common Core blueprint helps families understand what is being taught, what will be taught, and how learned concepts progress, logically building toward to new, more advanced topics. As already stated, ratios and proportions are a fluency requirement for seventh grade. Some of the focus will include real-world situations such as tax, discounts, tips, and other percentage problems. Students will solve problems about scale drawings, will graph proportional relationships and learn about slope, and distinguish proportional relationships from other relationships. Students will understand that fractions, decimals, and percentages are different representations of rational numbers. Furthermore, they will extend their mastery of the four basic operations (addition, subtraction, multiplication, and division) to rational and negative numbers as well as expressions and equations involving one variable. Seventh-graders will continue to work with area, including circumference and the surface area of three-dimensional objects. Congruence and similarity are on the horizon in Grade 8, and to prepare for that, students will reason about relationships using scale drawings and informal geometric constructions, as well as the relationship between angles and intersecting lines. They will also work with three-dimensional figures by examining two-dimensional cross sections, and they will solve real-world problems involving area, surface area, and volume. Having previously worked on single data distributions in Grade 6, seventh-graders will compare two data distributions and answer questions about the differences of the populations. Also, they informally will work with random sampling to generate data sets and learn about drawing inferences based on representative samples. 3 Grade 7: Introduction, Common Core State Standards Initiative. Though they may have seem detailed, the four areas of focus presented in the previous section are more just starting points of what seventh-graders can expect during this crucial school year. From those areas, teachers and students will delve into more specific concepts that will prepare kids for eighth-grade math and beyond. The five topics presented here, taken directly from CCSS 4 itself, include some details on what kids will be taught in seventh grade. Computing unit rates of ratios associated with fractions. For example, if you swim 1/4 of mile in 1/10 of an hour, a complex fraction of 1/4 / 1/10 miles, or 2.5 miles, per hour can be computed. Deciding whether two quantities are in a proportional relationship. This can be achieved by testing for equivalent ratios in a table or graphing on a coordinate plane and looking for a straight line through the origin. Identifying the constant proportionality—the unit rate—in tables, graphs, equations, diagrams, verbal descriptions, and word problems. Representing proportional relationships by equations. For example, if the total cost (t) of something is proportional to the number of items purchased (n) at one constant price (p), the relationship between the total cost and the number items can be described as t=pn. 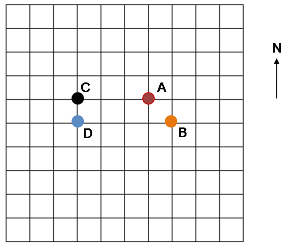 Explaining what a point (x,y) on a graph of a proportional relationship means in terms of the situation, especially to the points (0,0) and (1,r) in which r is the unit rate. Using proportional relationship to solve multi-step real-world problems. For example, if you paid $50 at a restaurant, and that total included a 20 percent tip, how much did you just pay for dinner itself before tipping? Adding and subtracting rational numbers (any number that can be written as a simple fraction, in which the denominator is not 0), and, from students’ understanding of fractions, applying these operations by using a number line. Describing situations in which opposite quantities combine to make 0, which is an additive inverse. For example, spending $50 to pay off a negative account balance of -$50 to reach 0. The knowledge of absolute value is extended: Understanding that p+q as the number located a distance |q| from p in a positive or negative direction (depending on if q was positive or negative). Understanding that subtracting rational numbers is the same as adding the additive inverse. For example, 7 - 4 = 7 + (-4). Dividing and multiplying rational numbers, and understanding that (-1)(-1)=1 and that -(p/q) = (-p)/q = p/(-q). Converting a rational number to a decimal using long division, and the concept of repeating decimals. Solving real-world problems involving rational numbers using the four basic operations. Use properties of equations to generate equivalent expressions. Students will apply properties of operations to add, subtract, factor, and expand linear expressions with rational coefficients. Also, they will discover that rewriting an expression or equation in a different form (for example, x + 0.1 = 1.1x is the same as increasing a number by 10 percent and is the same as multiplying by 1.1) can lead them to a better understanding of the problem at hand. Solve multi-step word problems with positive and negative rational numbers in any form (fractions, decimals, and whole numbers), and convert between forms when necessary (for example, if a business saw its profits increase by 10 percent in a year, it made 1/10 more money than last year). Solve word problems that lead to equations such as px+q=r or p(x+q)=r, in which p, q, and r are rational numbers. Student s will also learn to compare the algebraic solution to an arithmetic solution and identify the series of operations in each approach—for example, if a rectangle has a perimeter of 30 inches and a length of 10 inches, what is the area? Draw, construct, and describe geometrical figures and describe the relationship between them. Students will solve problems involving scale drawings of geometric figures, will draw geometric shapes (by hand, with a ruler and compass, and with technology) with given conditions, and will describe two-dimensional figures resulting from slicing three-dimensional figures such as pyramids and rectangular prisms. Use random sampling to draw inferences about a population. Students will understand that statistics can be used to gain information about a population, and they will also be taught about random sampling. Furthermore, seventh-graders will gather data from a random sample to draw inferences about a population with an unknown characteristic. For example, if a classroom has three more girls than boys in it, make an estimate about how many more girls are at the entire school. Draw informal comparative inferences about two populations. Simply put, students compare two groups and arrive at conclusions, including inferences based on variability. For example, if one cross country team averages 9-minute miles during practice and a second team averages 10-minute miles, what will happen if a runner logging 7-minute miles switches from the first team to the second? Understanding that the probability of an event lies somewhere between 0 and 1— with near 0 being unlikely, around 1/2 as about even odds, and near 1 as likely. Collecting data to approximate the probability of a chance event. For example, rolling a die 300 times and estimating a 6 will come up about, but likely not exactly, 50 times. Developing a model for probability and explaining its results and discrepancies. Using organized lists, tree diagrams, tables, and simulation to arrive at probabilities of compound events. For example, if half of the students in a classroom have brown eyes, what is the probability that if you pick a random eight kids, five will have that eye color? Junior high is a crazy time for many students. Many self-contained middle schools (schools that aren’t K-8) present unique challenges academically and socially. The homework load is greater, the routines are completely different, and kids that seemed so young just a couple years earlier are now … teenagers. Moreover, 67 percent of middleschool teachers feel that math is the toughest subject for students to re-engage in after summer break, and 50 percent added that kids’ math skills regress more than any other school subject. 5 Combining these factors creates a situation daunting for students and parents alike. And perhaps nowhere is the challenge more acute than with middle school math. However, there’s no reason why students can’t thrive during these two critical years. What follows are several tips for middle-schoolers and their parents to help them through this part of their math education. Seventh-graders: These tips are for you. No matter how much of a struggle middle school math may feel for you, the payoff will definitely be worth it. That may be of little consolation when you come across that equation in which you can’t solve for x no matter what you do, but even modest success now will help when you are in high school, in college, and in your future career. Be Cool If you have been looking through this guide at the topics you can expect to learn for this school year, you may be understandably intimidated. However, the way Common Core is designed, you will get plenty of instruction, practice, and reinforcement with one concept before moving on. Furthermore, you will discover that becoming good at a certain topic sets you up to succeed at the next. In many previous math curricula, teachers would move onto the next concept before many students felt they had mastered the last one. With Common Core, you can be confident you’ll be ready for whatever lies ahead. Practice When You Are Not Tired The homework loads of many students increase in middle school. However, your math capabilities are better suited for when you are most alert and less tired. Therefore, try to work on math homework in the later afternoon or early evening when you are at your freshest after school. Getting all your homework completed is important, but reading a book for a literature class won’t require the computing power from your brain that math will. Read the Question You might encounter math problems that appear intimidating, both on first glance and after you’ve read the question. No need to worry: Almost everything being thrown at you is stuff you have learned or are currently learning. Clear your mind and read the question again. Break down the problem by writing all the given information and relevant numbers. From there, work your way through the question on your path to the answer. Once you master this process, all those intimidating problems won’t seem so frightening. Check Your Work One helpful aspect of solving algebraic equations is that checking your work is easy: Simply plug in the answer into the variable of the original problem and do the math. This is a good habit to start with your homework because if you made a mistake, you have time to figure out what went wrong, which will help you all the more in the future. Furthermore, once you are proficient in checking your work accurately and quickly with your homework, you will naturally do the same on tests, possibly (and hopefully!) resulting in better grades because you are catching your mistakes before handing the test in. Keywords, Keywords, Keywords! One math strategy you likely learned in elementary school is to look for keywords when solving word problems. Keywords are simply clues within a word problem that guide you toward a solution. This strategy is just as applicable in middle school as it was when you were younger, maybe even more so as you work to solve multi-step problems. Moreover, with new concepts you are learning, a new set of words will be entering your math vocabulary. Look for terms such as save, rate, per, proportion, percentage, and compare in middle school word problems. Skip the Calculator You will encounter plenty of math in the coming years (especially in trigonometry and pre-calculus) that will require the use of a calculator. At this level, however, you should know how to perform almost every required operation without technological help. Skipping the calculator and figuring out problems by hand (for example, computing circumference by multiplying by 3.14) keeps your skills sharp, shows the teacher you are taking time to solve problems instead of taking a shortcut, and prepares you for tests on which a calculator isn’t allowed. Math Everywhere Much of the math you are learning now can extend to rest of your life. Look for opportunities to practice your skills outside of school. For example, if you are watching a football game and see that a quarterback has completed 15 of 24 passes, try converting that number to a fraction and a percentage. Or, figure out what percentage a $5 tip on a $27 haircut is. Your math skills will help your realworld skills that when sharp, will improve your in-school math skills in turn. Ask for Help If you find yourself struggling with a specific concept or with math in general, by all means, seek help from your teacher. Educators want you to succeed, and they will do whatever they can to help you do so … but sometimes, you have to ask. Also, don’t be afraid to tell your parents that you are having a rough time. Most adults remember how challenging middle school math was, and your parents can provide encouragement, work with you and your teacher, or explore other options to get the help you need to succeed. 5 The Raytheon MathMovesU Survey, November 2006. Be Cool This is sage advice for parents as well as students. The level of math education you and your child encounter in middle school is unlike anything you may have experienced before. Yet, students this age are ready to take their learning to another level—the curricula wouldn’t include such content if they weren’t capable. Though there may be bumps along the way, your child can still reach the destination. Relearn the Math One reason parents are apprehensive to engage their middle-schooler with his or her math homework is that they might be a few decades removed from the math itself. Most parents remember how to multiply, but they might not have a clue how to solve twovariable inequalities. Middle school math isn’t so difficult that adults can’t relearn the concepts. Many websites are available that describe a variety of math topics, or if you can sneak in 20 minutes here and there, read your student’s textbook (just don’t let your kids catch you!). Once you understand the math a little more, you will be better able to help your child when he or she is struggling. Understand Common Core Irrespective of your opinions about Common Core, more than likely, your kids are learning in a curriculum following the standards. Therefore, understanding the goals, guidelines, and structure of CCSS ultimately will help as you support your middle-schooler through these years of math. For example, your child may be learning methods and strategies to solve a problem that you have never encountered. Your first inclination might be to dismiss these approaches and not offer any support. However, knowing that Common Core aims to provide multiple methods so that students achieve a well-rounded mastery will give you clarity on why your child is learning something a certain way … and it may inspire you to learn this new strategy as well. Drill for Skills Find opportunities for your middleschooler to practice math outside of his or her schoolwork. Challenge your daughter to compute tips. Direct your son to figure out what percentage of a gallon of gas is tax (the tax price is usually on the pump). If you are stuck in traffic or driving to an afterschool activity, fire off some rapidfire problems and equations, such as converting fractions to decimals. A couple extra minutes here and there keeps kids’ minds actively focused on math skills, which will be sharpened for when they are testing or doing homework. Become Involved If you are concerned with how Common Core is being implemented at your school, the amount of homework being given, or anything else in the math classroom, then you should absolutely get involved. Talk to teachers and administrators. Attend committee meetings. Research the subject that has you concerned. Parents naturally will have opinions about the quality of their children’s education. Those opinions can affect dialogue and solutions, but only if you take action. Your middleschooler is working hard to get the best education possible. There’s no reason you shouldn’t do the same for your child. Make sense of problems and persevere in solving them Students explain the problem to themselves and determine ways they can reach a solution. Then, they work at the problem until it’s solved. By middle school, for example, many word problems are multi-step, requiring more than one operation on the way to an answer. Students must take care to determine what these steps are, decide what strategies (including correspondences between equations, verbal descriptions, graphs and tables, and looking for regularity and trends) will be necessary to solve the problem, and work toward the solution. Reason abstractly and quantitatively Students decontextualize and contextualize problems. By decontextualizing, they break down the problem into anything other than the standard operation. By contextualizing, they apply math into problems that seemingly have none. Middle-schoolers who are decontextualizing may envision a fraction or decimal into unit rates—for example, a student working with the fraction 3/8 might picture three squares across a chessboard—to help solve a problem. Students who are contextualizing might break a polygon into several smaller shapes in order to compute the total area. Construct viable arguments and critique the reasoning of others Students use their acquired math knowledge and previous results to explain or critique their work or the work of others, analyzing and using counterexamples as necessary. 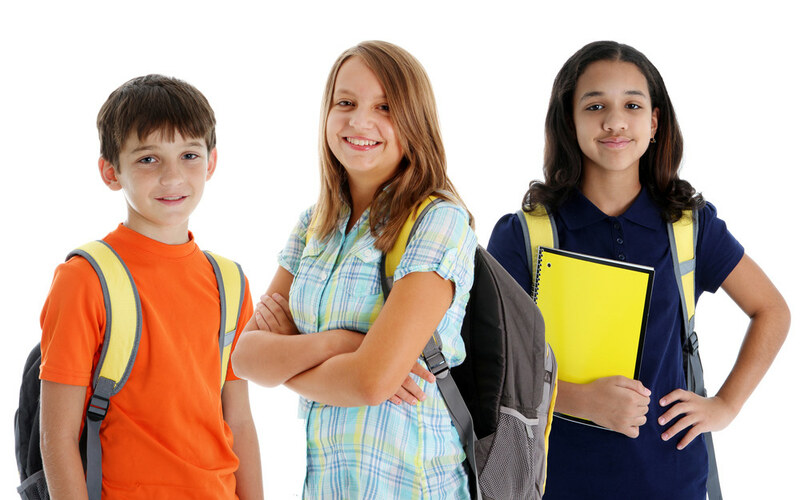 Most middle-schoolers have already learned how to work with classmates to achieve a goal. Students might be encouraged not only to work with a group to solve a particularly challenging math problem, but also to present and explain their solution to the teacher and the class. Model with mathematics This is just like it sounds: Students use math to solve real-world problems. For example, a national department store chain offers sales either in the form of percentages off retail price and by a flat dollar amount savings (and sometimes both). Middle-schoolers can use their knowledge of ratios and percentages to determine from which sales method they will save more. Attend to precision Students strive to be exact and meticulous—period. The math vocabulary introduced to middle-schoolers rapidly expanding, so students must be precise in their words as well as their numbers. Consider this example: An equation (x=1) is different than an expression (x-1) and an inequality (x>1). Middle-schoolers who know these definitions will have an easier time when working with the corresponding concepts. Look for and make use of structure Students will look for patterns and structures within math and apply these discoveries to subsequent problems. Take the equation x +5=10; to get an answer, 5 must be subtracted from both sides. This basic algebraic structure will apply to almost all equations middle-schoolers will encounter, no matter the operation or the number of variables. Once students recognize and master this structure, they will automatically think about both sides of the equation when solving. Look for and express regularity in repeated reasoning Students come to realizations—“aha” moments is a good term for these realizations—about the math operations that they are performing and use this knowledge in subsequent problems. For example, middle-schoolers may discover that tipping 15 percent is an easy computation: Figure out 10 percent of the bill, then take half of that and add to get 15 percent. In no time, they will want to figure out the tip when you are at a restaurant. 6Standards for Mathematical Practice, Common Core State Standards Initiative. In an alloy, the amount of copper is 2 kg 30 g and the amount of zinc is 203 g. What is the ratio of zinc to copper? 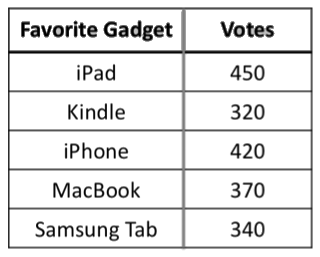 The table shows the number of votes that each of the gadgets got. Which ratio is the highest? Are 28:33 and 56:66 in proportion? The table shows the number of pages 4 of Belle’s friends read during the long weekend. If the number of pages read varies directly with the number of days spent reading, find the constant of proportionality. Which of the following is not in a proportional relationship? Is the cost of meeting proportional to the number of attendees? 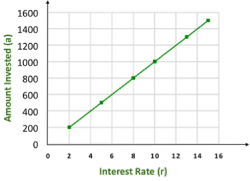 Select the equation that represents the graph. The tables below show the amount of flour used to bake cakes. Select the table that shows a proportional relationship. Identify the option that best represents the Greyhounds play In a game of football, the Greyhounds gained 7 3/4 yards in the first down, and lost 6 1/2 yards in the second down. Identify the numerical expression that represents the situation Samantha has a negative balance of $150 in her bank account. She writes out a check for $500. How much money does she have in her account after the check was cashed? A man bought 4 1/2 lbs of apples, 2 3/4 lbs of guavas and 3 1/5 lbs of oranges. How many lbs of fruits did he buy? The value of a stock priced at $132.30 in February crashed by 70% in March. What is the value of the stock in March? Jeff finishes a three mile walking race in 25.5 minutes. What is the average speed of the walker in miles per minute? In the last tennis game, Charlie served an ace 15 times out of 25 service attempts. If he gets to serve 40 times in the next game, how many aces would he serve at the same rate? Select the correct option: At an amusement park, each person pays $5 to enter plus $2 for each ride. Brandon has a $3 discount coupon. Write an expression for the amount Brandon pays if he goes on 8 rides and uses the coupon. Debra won $10,000 in a lottery. She invests $4,500 in a savings account, earning annual interest at 6 1/4%. She invests the remaining amount in stocks. If she earned a total return of $1,106.25 at the end of the year, what is the rate of return from stocks? 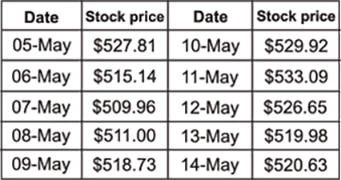 Enter your answer rounded to two decimals The chart gives the stock price of Tomato Inc. What is the difference between the maximum price and average price of the stock? Which equation does this set of algebra tiles represent? Select the equation that shows the use of distributive property of multiplication over subtraction. 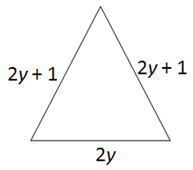 Find the perimeter of the triangle, in units, if y = 2.5 units. The amount of money left in the piggy bank if Jerry has $105 in his piggy bank and he spent $’x’ to buy a gift for his mother. The number of miles Gary drove last week if Gary drove a total of 105 miles this week and drove ‘x’ less miles this week than he drove last week. The number of pages left if ‘x’ is the total number of the pages in a book and Beth read 105 pages. The number of stamps that cost $0.25 or more if in Linda’s collection of ‘x’ stamps, 105 stamps cost less than $0.25. Following an increase of 5% in the cost of gas, a gallon of gas now costs $3.50. Use the variable x to represent the cost of gas before the increase. Cathy is 5 years older than Mary. Emma is one-half Cathy’s age. Samantha is 13 1/2 years older than Emma. Samantha is 25 years old. How old is Mary? Complete the inequality and solve Peter is organizing a get together of his college friends. He has $400. Rent for the conference hall is $45 per hour. The hall is available only for whole hours. Amenities cost $11 per hour. He estimates that refreshments will cost $150. Write the inequality and calculate the maximum number of hours, x, for which he can rent the conference hall. A scale drawing of a wall of Christina’s classroom is shown. 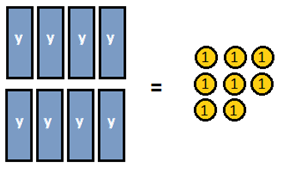 Each square is a unit cm square. The wall measures 9 feet × 26 feet. The scale factor used is _ : _ . The map of an orchard is shown in the image. The scale used is 1 unit = 4 feet. An apple tree is 16 feet away from the northern side fence. It is 16 feet from the fence on the eastern side of the orchard. The apple tree is located at point _ . Enter the answer rounded off to 2 decimal places Mrs. White is remodeling her kitchen. 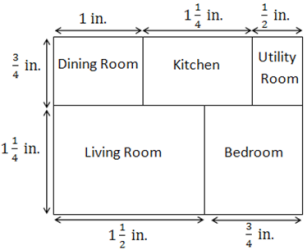 She makes a scale drawing of the floor cabinets using the scale 1 in.= 3 ft. One wall will have floor cabinets measuring 3 ft.× 8 ft. What will the area of the floor cabinets be in the scale drawing, in square inches? Fill in the missing number In the blueprint, 1 inch represents an actual length of 16 feet. The actual area of the living room is _ square feet. What will be the cross section when the square prism is cut by a plane perpendicular to the base? 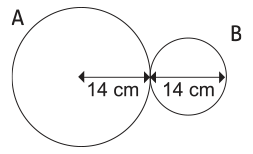 The difference between the circumference of circle A and circle B is _ cm. Take π = 22/7. The circumference of a penny measures 59.8 mm. The circumference of a nickel is 6.4 millimeters more than that of a penny. Which is the best estimate of the diameter of a nickel? Use π= 3.14. The measure of angle x is _ °. When cut by a plane, which of the shapes will have a rectangle as the cross section? 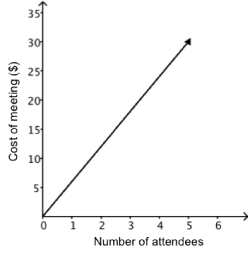 The angles ∠AOB and ∠COD have the same vertex. Hence, they are adjacent angles. 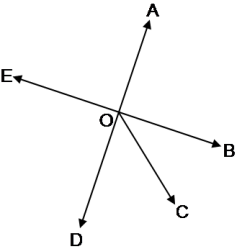 The angles ∠AOB and ∠DOE are opposite each other. They are formed when two lines intersect. Hence, they are vertical angles. Which sample set should Mathew take for his research? Matthew is carrying out a research on the purchasing habits of young couples. He has collected two sets of data. Mia has been asked to organize a Christmas party for the elementary students of Blue Bells School. She wants to know which types of milkshakes to provide at the party. She asks 40 elementary school students about their preference. This is a sample that is representative of the population. She finds that 22 students prefer chocolate milkshake. If there are 120 students in the elementary school, estimate the percentage of students likely to prefer chocolate milkshake. Select all the correct options Cathy plotted the time taken by a group of boys and girls in completing the 100 m dash. She concluded that the group of boys is a more competitive lot. Which statements support this conclusion? The average time taken by the boys is lesser than that of the girls. The values of time taken by the boys are more clustered. The range of boys is less than that of the girls. The maximum time taken by the boys is much less than that taken by the girls. Gabriel wants to choose a name from a phone book page that begins with Benjamin and ends with Brayden. Which point indicates that he will choose a name that starts with B? Pedro has a collection of 6 rock CDs, 7 classical CDs, and 5 jazz CDs. He randomly selects a CD to listen to. What is the probability that he selects a classical CD? Zack has 12 orange lollipops, 9 cherry lollipops, 6 grape lollipops, and 3 lime lollipops. What is the theoretical probability that he randomly selects a cherry lollipop? 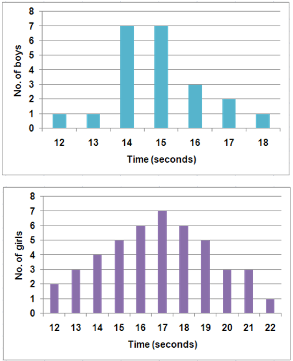 The frequency of the number of games won by Jim on a game board spinner is shown in the chart. Estimate the number of times he will win, if he gets to spin 29 times. Identify the tree that represents the outcomes Susan has a bag containing 4 marbles - 3 green and 1 purple. She draws a marble. Without replacing it, she draws a marble the second time. Fill in the missing numbers rounded to 2 decimal places A spinner is divided into 2 colors, red and yellow. The probability that the needle of the spinner would land on yellow is 0.35. The spinner is spun two times. Find the values of A, B and C.
Fill in the missing numbers In Let’s Play Casino, there are two spinners which have to be spun one after the other. The total number of outcomes of spinning the two spinners is _. A winning combination must have D in the second spin. The probability that a winning combination will come up is _ %.